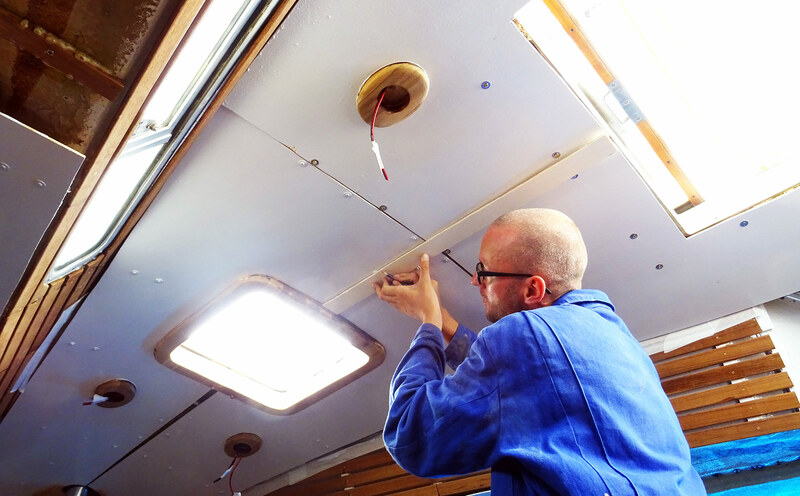 Quick update on the King´s Cruiser´s refit program: Since I was very busy working during the last months I unfortunately found very little time to work on my boat. 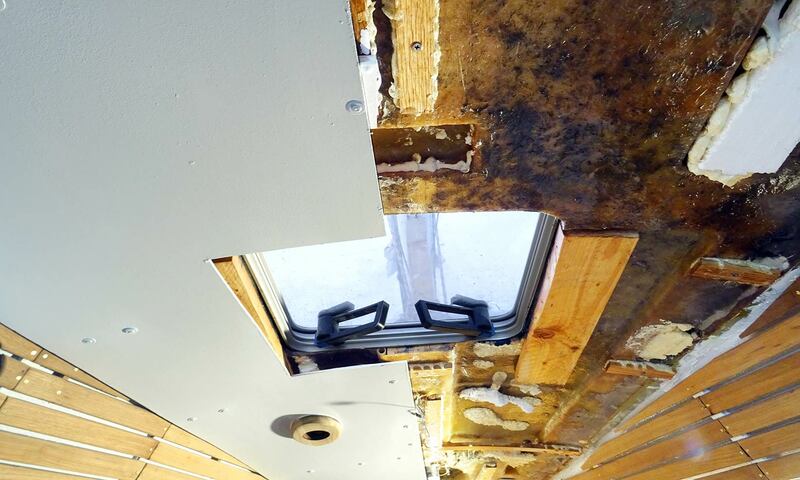 But lucky as I was I could spare some hours during last weekend and return to the site to go on with the interior refit program: This time it´s part 6 of the roofing panels series: Fitting of decorative stripes. But where are we now in the project anyway? The port side large central panel is mounted, screws painted white. Last time (read it here and here) I assembled the main panels of the saloon roofing and was very proud of my work indeed. Another layer of Toplac in white was applied to hide and seal the bolt heads and I must say the whole saloon looks just so much different from the trashy look it bared for nearly two years now. It´s much more light-suffused, friendly and welcoming. But there are some downsides to this, as you may have seen. So I decided to go for Teak stripes to cover the large seams. But a single batten of 4.5 centimetres would be too narrow as I would need to drill holes for screws, so two battens are needed. But two aligning two battens longitudinal next to each other perfectly over a large seam can´t be done without a third batten, a substruction if you will. I decided to cut stripes of plywood of some 6 centimetres width. 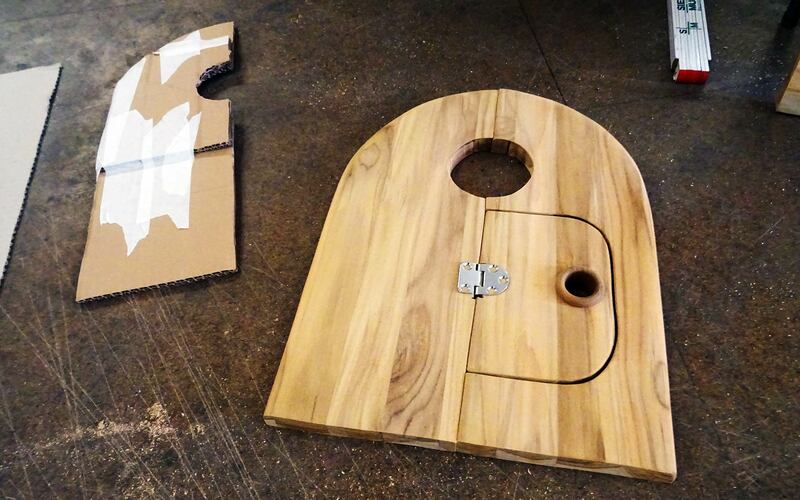 Taking measurements of the very area to be attached and cutting out holes for the screw heads was the second task. 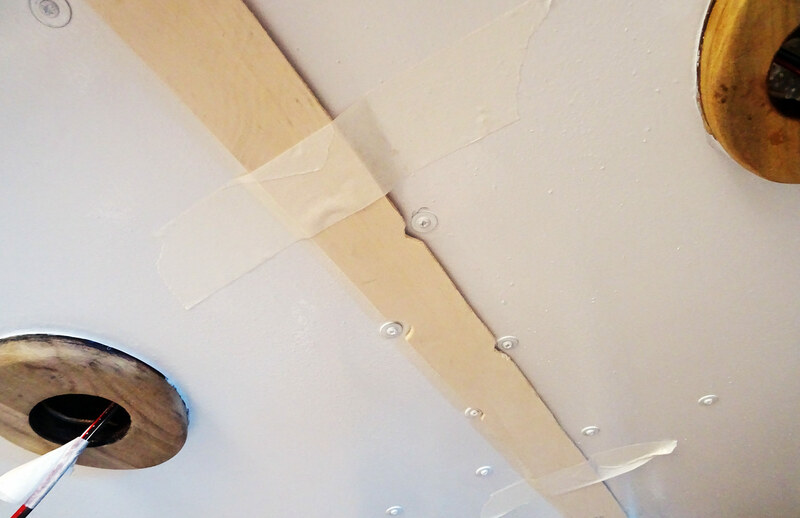 I then taped the plywood-batten to the ceiling and checked if this batten would have a clear and straight area of support all along the roofing panels itself, which it did have. 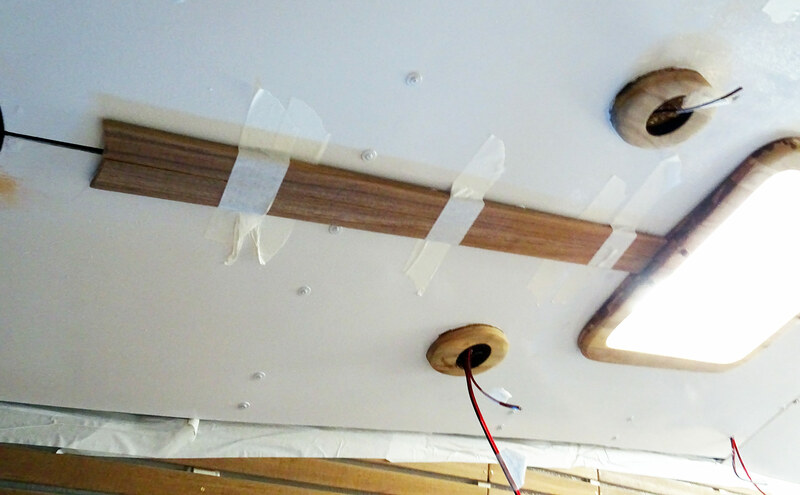 The plan is first glue the batten to the ceiling, later put in some screws for additional rugged support of the whole stripes. Then I cut two Teak batten in size and taped them onto the plywood batten to see if it looks right. It does! I took off everything to have Teak and plywood-batten glued to each other with D4 PUR-glue and a lot of pressure, which I applied overnight. Upon taking off the clamps I had to sand the Teak surface clean and smooth and seal off the bare wood with Epoxy on the backside (like I did with every Teak made item in the course of the refit-program. By the way, do you remember my post about what to do with spare Teak? 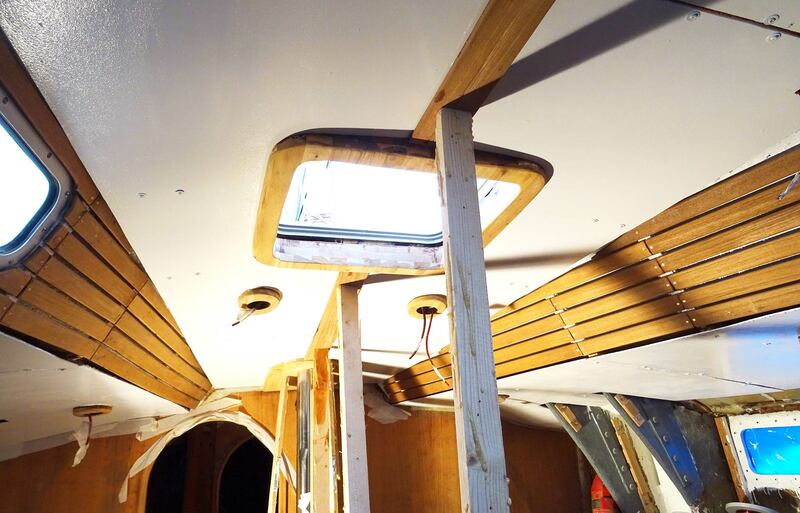 I did have this idea of making a mast framing with a small access hatch for the mast-wiring of navigation lights (you may read this article here). 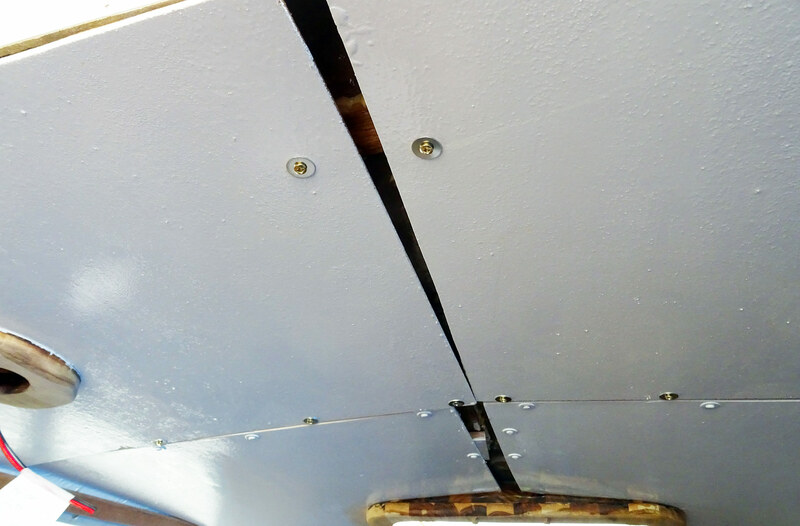 After a long and sometimes awful painstaking process of finding a way to make the access hatch open and close safely, I also glued these two parts around the mast stand and onto the roofing panels. As it is planned with the decorative stripes, the mast framing will later on also be screwed to the Oak substruction underneath the new roofing panels. 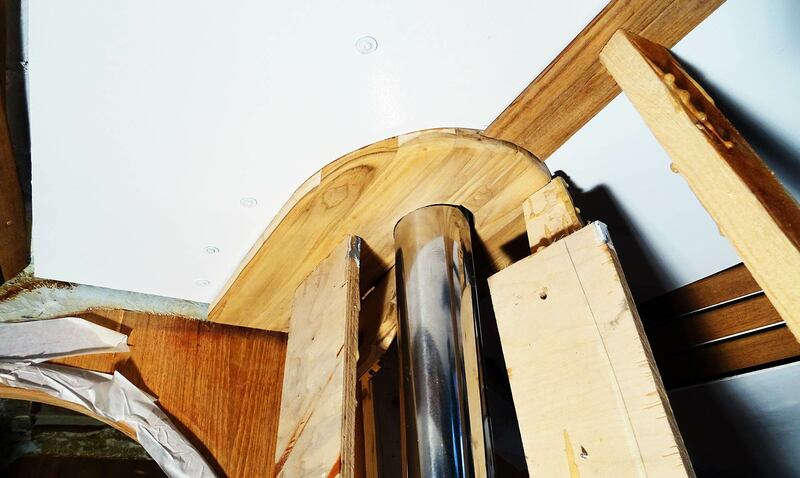 Oh, how I love the Teak-made plinths (how they are made can be read here) for the new LED-lights! It´s a completely different look from the King´s Cruiser I bought originally. 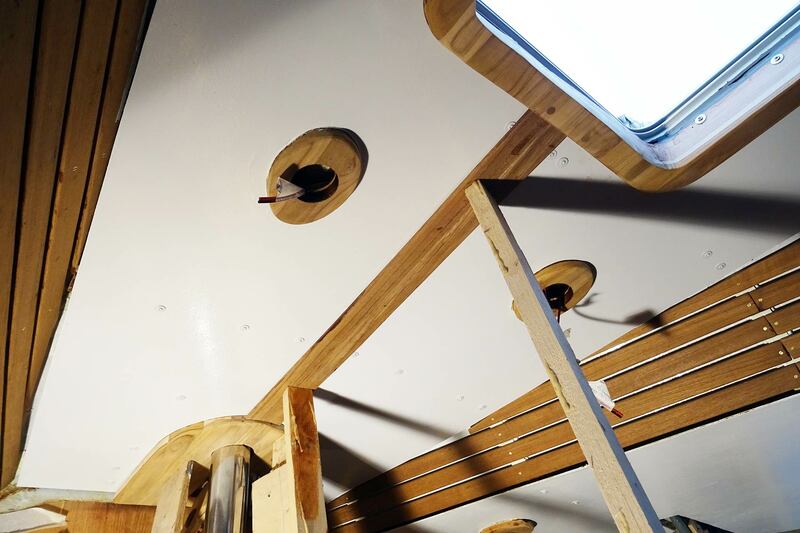 Although my work is way behind something we would call “professional”, I would say that the look of this – even now, unfinished – is way more classy and significant that this yacht is in her original fitting. Beware of sanding of GRP: Which dust masks deliver best protection?